Thanks for coming along to Saltoun Wood for our November event on a less than hospitable day for weather and thank you the many people helping out on and leading up to the event. Saltoun is a wonderful area for lots of activities and visits leading up had been glorious. Setting up and removing controls in the dark was fun also. I thought the runabilty of much of the woodland was compromised by recent tree felling however, so I choose to use some less used area south of the stream. In hindsight the longer courses were not helped by the slippery conditions on the day and difficulty of the green course was increased by the misplacing of a two or three controls, apologies to anyone who was hindered by this and well done to those who battled on to complete the course regardless. Our ELO event was preceded by the final Junior Training session to be organised and coached by Bill Stevenson and Maureen Brown for East Of Scotland area. Many thanks to Bill and Maureen for all their efforts over recent years. Sheila Strain also added a pre-event 1km training exercise which practiced compass skills and accurate navigation. 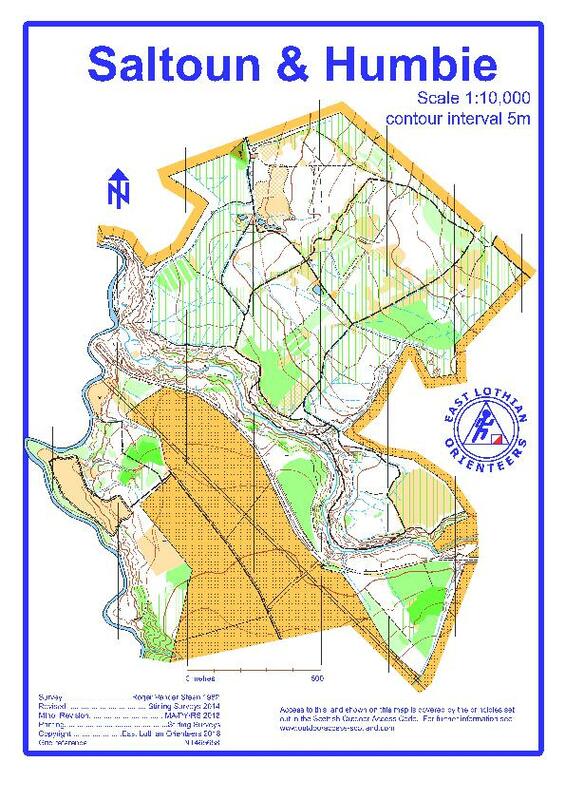 There will be courses for orienteers of all ages from White, Yellow and Orange and a proper Green (TD5) course in the tougher forest terrain. Everyone is welcome to join us from 1pm for registration, with starts from 1:30pm until 2:30pm. Stop press: Sheila has planned a training exercise which you can try before your competitive run – ask at Registration for a copy of the training map. Local event in the East of Scotland Orienteering Association (ESOA) series. The woods are used by the general public. Please respect their right to be there at the same time as you are orienteering and leave the small “official” car park at the entrance to the wood to its regular users. You must not enter any out of bounds areas. Area is used by dog walkers so dogs are welcome. Assembly and registration is in the field opposite the farmyard south of the minor road between East and West Saltoun. Both villages are just south of Pencaitland in East Lothian. Parking is in the margin of the field opposite the farmyard. Please bring £1. Registration is from 1:00pm to 2:15pm in the parking field. Pre-entry is not available; all entries will be taken on the day. The registration form can be downloaded and completed before you arrive which will speed things up. have your own dibber registered with SI. There are no public toilets in the area. The Bothy Cafe in East Saltoun has toilets for customers. The Winton Arms in Pencaitland welcome walkers and so may be amenable. The start is at the entrance to the wood (about 400 metres from the car-park and Registration). The finish is roughly 100 metres into the wood (about 500 metres from car-park and Download). Start times are from 1:30pm to 2:30pm. Please report to the Download by 3:45pm, even if you have not completed your course. Controls will be brought in from 3:45pm. The map is printed at 1:10,000 with 5m contours and has seen some minor revisions. SportIdent (SI) electronic timing will be used – we will have SIs for hire free of charge but there is a £30 charge if lost. There will be White, Yellow, Orange and Green courses. More details about the colour coding is available on the Scottish Orienteering website. Entry is cheaper if you are a current member of a club and are affiliated to Scottish or British Orienteering. Please make sure that your membership has been renewed for 2018. Short remnants of ruined fences create potential trip hazards. If you, or anyone in your group (including juniors), have a medical condition that first-aiders or health professionals should know about in the event of accident or illness during the course of the event please print off the Medical Form, complete it fully and bring it along to the event. You should complete a separate copy for each individual who has a medical condition. Please leave the completed Medical Form at Event Registration. If it is not in a labelled sealed envelope, it will be put in one and will be opened only in an emergency. It will be shredded immediately after the event if you do not claim it back. When entering our events your name will appear in the results section of this website and may appear in newspaper reports. We may also take photographs at the event for publicity purposes – please let us know if you do not want us to use your photograph in this way.